It is not easy to carry out these transformations, which liberate large amounts of energy. Chemical reactions are much easier to be carried out, but their energy yields are about thousand times lower. The atom consists of electrons orbiting the nucleus. When you form molecules, the atoms get together, by forming chemical bonds. In this process only the electrons are involved, so that the nucleus stands by. These are chemical processes. The energy transferred corresponds to the energies of the electrons involved. Nuclear processes involve changes in the nucleus. Because the nucleons (protons and neutrons) are subjected to enormous forces (much stronger than the forces electrons are subjected to) the energies involved are much higher in nuclear processes than in chemical processes. In fact they are millions of times higher. There are two major types of nuclear reactions, for energy generating purposes: Nuclear fission and nuclear fusion. In nuclear fission, an atomic nucleus is split. It is usually the uranium atom that is employed for this purpose, because it is the largest atom in the periodic table and as a result it is a bit unstable. But it still needs to be hit in order to split. The uranium atom splits when it is hit by a neutron. This way, it produces 2 or 3 fragments, and 2 or 3 more neutrons, which will hit other nuclei and split them. This way the process follows through so that the reaction is self-sustained; it is a chain reaction. The nuclear fuel (uranium) can transfer all its energy in a fraction of a second (atomic bomb) or it can do so throughout a larger period, of perhaps one year or more (nuclear reactors for producing electricity). Atomic bombs based on uranium or plutonium have their powers measured in kilotons (1 kiloton= 1000 kilos of TNT). TNT is used as the standard measure of strength of bombs and other explosives, because it is the commonest explosive in all sorts of applications. It is a high explosive. This is usually achieved using hydrogen atoms to produce helium. The nuclei of atoms are positively charged, so that they will repel strongly at short distances from each other, what makes their fusion difficult to accomplish. 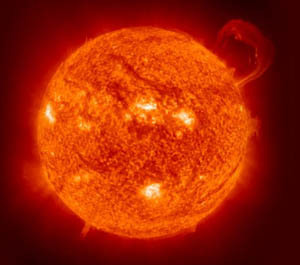 Very high temperatures must be used for this purpose, temperatures as high as in the centre of the Sun (about 300 million degrees Celsius). Hydrogen has atomic number Z=1. This is the most simple element. If you fuse hydrogen nuclei together you can produce helium (He) nuclei. If you keep fusing nuclei and building larger ones you can eventually produce the whole periodic table! These processes occur inside stars and that is how all the elements we see in our planet and in the Universe have been produced. When massive stars reach the end of their lives, they explode liberating the elements produced by fusion. We are made of stardust! Fusion reactions take place inside the Sun and all the stars. Man made fusion reactions are produced in the hydrogen bomb. Atomic fusion bombs have their powers measured in megatons (1 kiloton= 1.000.000 kilos of TNT). There has been a lot of research to produce a nuclear reactor to sustain fusion reactions in a controlled manner in order to generate usable power, but that goal has not yet been achieved. However, there are machines, called tokamaks, which are able to produce a controlled nuclear fusion but the power produced by these machines is less than the power they consume. That is because a lot of energy is needed to heat up the plasma (extremely hot hydrogen gas) and to contain it using magnetic fields. However, it is expected that in the future such machines will be able to generate energy . Check this link for more information on tokamak's . 1) Nuclear reactors that are based on the fission of uranium or plutonium. When we mention nuclear reactor we usually refer to fission reactors. The main advantage of nuclear power is the fact that it doesn't produce tons of gaseous emissions. It produces a relatively small amount of liquid and solid wastes, which are very dangerous but can be kept safely, in principle. These are collectively known as nuclear waste. It is a very dangerous waste, because they contain the highly radioactive fission products, and the problem of its long term storage is still open. As mentioned above, this waste can be kept (usually buried in a safe place) unlike the tons of CO2 and other substances that are released in the atmosphere. Coal fired power stations, on the other hand produce lots of CO2 which causes global warming. Because coal is never pure, it also contains nasty substances that are also released on the atmosphere after the combustion. The most mentioned is SO2, which causes acid rain (by combining with water to form sulphuric acid). There are technologies to remove SO2 from the flue gases but those are very expensive. It can also contain the notorious heavy metals, like mercury, cadmium, lead etc.... Those are also present in the soil. Finally, coal can also contain radioactive elements like uranium and others, so that the emissions of a coal fired power plant also include some radioactivity. Another advantage is that the fuel lasts for long periods so that the plant doesn't have to be refuelled all the time, as it is the case with the use of fossil fuels, which require train loads arriving daily. The dependence on fossil fuels, specially oil, has lead to wars which killed thousands of people and also contaminated the environment with massive oil leaks and fires. The nuclear option can reduce this dependence. In fact oil leaks have happened even in times of peace. The most notorious are the Exxon Valdez spill in Alaska and the BP oil spill in the Gulf of Mexico. Finally, we must consider that burning oil is a poor use of a material that can be used for more constructive purposes. It can be used to produce all sorts of plastics, dyes and much more. Although those still don't exist, they are expected to generate clean energy (no radioactive wastes) at a very low cost, because the process generates lots of energy and the feedstock is cheap (hydrogen). It will be a revolution that will solve all energy problems in the planet. The sun is the source of energy for all life and processes in the earth. Imagine if we could create more suns, next to us! In nuclear reactions mass is transformed into energy. Products have lower masses than the reactants, and that difference equates to the amount of energy liberated in the reaction, according to Einstein's famous equation above. Like chemical reactions, that form products with stronger chemical bonds than the reactants, nuclear reactions also form nuclei that are more strongly bound. If you look at the diagram below, we can see that fusion reactions produce more strongly bound nuclei until they reach iron (Fe). After that, the fusion reactions will consume energy rather than liberate. That is why stars end up with a nucleus of iron - they can't get fusion energy out of iron. The heavier elements, like silver and gold, cannot be produced in the functioning star. They are produced during the supernova explosion, that occurs after the star dies. 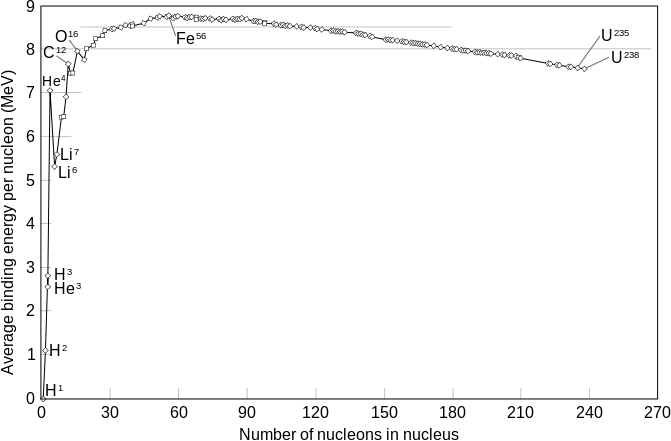 We can also observe in the graph that uranium is at the end, because it is a very heavy element. Because it is so big, it is more unstable than the others so that it can be broken (fissioned). The fission process will produce nuclei that go up the graph, to the left, what means that they are more strongly bound than uranium. That is why nuclear fission is also a process that releases energy.